Do you wake up with a sore neck? Is your partner bothered by you snoring? We have a solution. The Bodyform® Orthopedic Nightwave™ Gel-Infused Convoluted Pillow is engineered with two cervical rolls, one small and one larger. The two sizes allow you to choose the right size for proper neck support. Proper neck support will reduce the incidence of both neck pain and snoring for a great night’s sleep. Pillow soft foam naturally breathes providing the proper environment for healthy skin. Proudly Made in Canada, Bodyform® Orthopedic has been trusted by Canadians for over 40 years providing ultimate comfort, quality and long lasting support products. Gel-Infused Memory Foam Convoluted Surface provides a soft feel and extra airflow for a cool nights sleep. Made from “Pillow Soft” foam, designed to provide the ultimate in comfort and support. 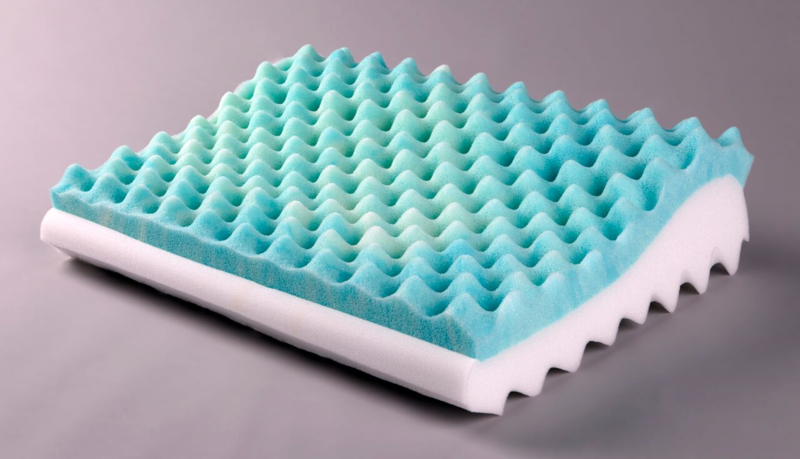 “Pillow Soft” foam is 100% hypo-allergenic. Engineered Cervical design promotes proper alignment of the spine for back and side sleepers. High-Quality zippered Percale cover is easily removed for washing. Standard Size: 21” wide x 14.5” depth x 5.5” high.